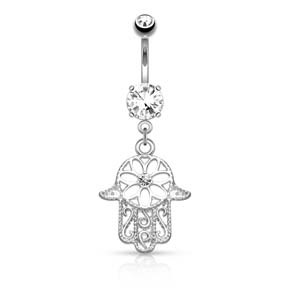 Stay protected with this intricate Hamsa hand dangle belly bar, with a clear jewelled top ball. The dangly Hamsa Hand has a tiny clear stone in the centre and measures 14.5mm x 17mm, and the piece is finished off by a 5mm clear jewelled screw on top ball. The surgical steel shaft is 10mm (3/8") in length. The best eCommerce software by ShopFactory powers P12551. All-in one eCommerce and shopping cart software.